Earlier this month, during the king tide, Bill Needelman led a walking tour of Portland’s Bayside neighborhood to show Portlanders what impact the highest tides of the year have on the city’s waterfront. We wanted to know more about king tides and Needelman’s role as the city’s first waterfront coordinator, a job that includes managing what happens when water starts pooling around the city’s storm drains as climate change literally increases sea levels. MANY HATS: Needelman has a lot of duties beyond tracking the impacts of climate change on the city’s waterfront. 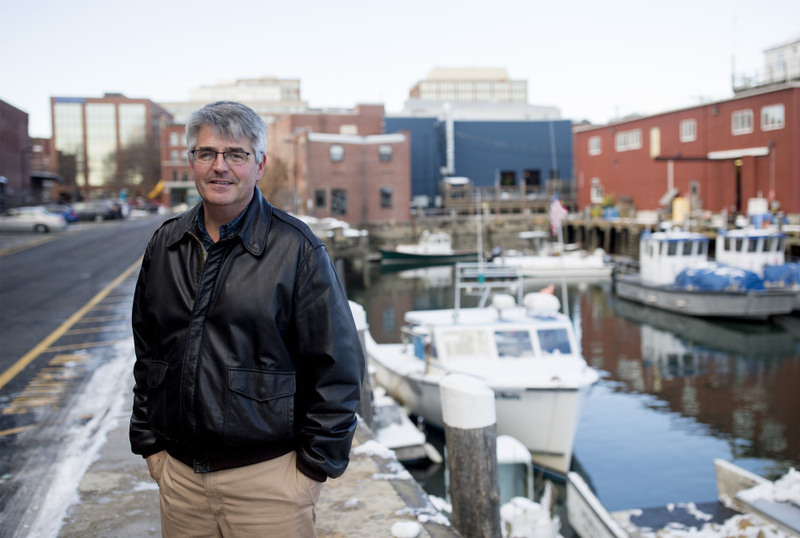 He staffs Portland Fish Pier, helps plan open space and infrastructure projects on the waterfront and serves as the liaison when local policy issues overlap with the state and federal governments. Beyond these, he works with private pier owners and manages issues that arise with the city’s piers. THE PRINCE OF KING TIDES: What do king tides have to do with that? “Sea level rise and climate change overlaps with everything on the waterfront, so it has become one of my program elements.” After all, Portland is surrounded with water, whether it be Casco Bay, the Fore River or Back Cove. Or the puddles that appear in Bayside when rain and high tide coincide. WALKING THE WALK: For several years Needelman has been organizing city staff walks during astronomical tides. “I describe them as a scavenger hunt for water.” The best place to go looking is the Bayside neighborhood, since geographically it is one of the lower elevations in the city, “and it is widely recognized as vulnerable to flooding.” The Dec. 5 king tide walk was organized by Jan Piribeck, an art professor at the University of Southern Maine who has organized art projects around climate change. RISKY BUSINESS: The idea is to use the tides as “an opportunity to better understand our risk as a coastal community.” They find water in catch basins, ponding in roadways and in all the usual places, like the intersection of Somerset and Franklin streets. Or as you may know it, that corner near Whole Foods supermarket that flooded so badly in September 2015. Was that a king tide? Astronomically high, yes, Needelman said, but also one that coincided with a torrential downpour in the middle of the day. Some king tides come and go in the middle of the night, he said, without much notice from the (sleeping) public. RECIPE FOR FLOODING: Those mega-puddles, or “nuisance flooding,” that swamped cars were the result of tide and rain hitting when storm water pipes that let out into Back Cove were below the surface of the ocean. “There was nowhere for the water to go.” Needelman coordinates with the Public Works Department to mitigate potential future flooding. They keep the storm drains clean and street-sweep steadily. “That is constant work that they do to make sure that flooding events are as small as possible.” As waterfront coordinator, Needelman is never far from a tide chart so they can be prepared. Correction: This story was updated at 3:37 p.m. on Dec. 20, 2017 to correct the spelling of Bill Needelman’s last name.